Seriously, no one saw how ironic this was? For example, how Lexile scores should be used to differentiate texts for all learning levels…and then everyone should take the same reading test. Or how suspension is a terrible deterrent for bad behavior, and actually causes struggling students to fall even further behind. 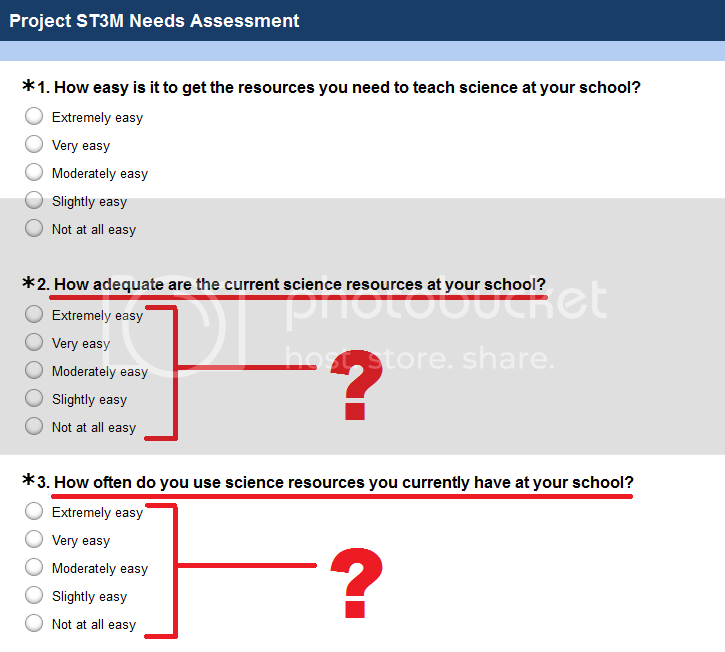 Or how a survey about STEM resources (designed to promote science, technology, and math, but not English) fails to understand basic semantics. Oh, and I’ve already mentioned how ridiculous these surveys are before. But the newest entry on my “Seriously, no one saw how ironic this was?” list comes courtesy of the FitnessGram initiative. Used without permission…because I’m a rebel. FitnessGram is a program that was developed back in the 80s and is “designed to increase parental awareness of children’s fitness levels by developing an easy way for physical education teachers to report the results of physical fitness assessments” (http://www.cooperinstitute.org/fitnessgram). Today, the program has been implemented in thousands of schools across the US (including mine). It sounds good in theory. According to my paraphrasing of the information I found on the website, it’s a criterion-referenced assessment program that uses a baseline to evaluate a student’s attainment of health-related fitness standards. THAT’S TOTALLY THE SAME THING AS A CRCT, BUT FOR PHYSICAL EDUCATION!!! Was I the only one who flipped out when I realized that? Sorry…sometimes I overreact. Yeah, so they have a CRCT for PE now. What of it? They test everything nowadays, right? Take a look at the parent FAQ for the program to see the irony. Q. Will schools use FITNESSGRAM to grade my child? We grade students based on their math, science, social studies, and language arts CRCT scores…why not in physical fitness? Well, the FAQ provides a handy PDF to explain why. The Scientific Advisory Board discourages references to “passing” test items. The fitness assessments are designed to help students learn about their current levels of fitness and to use the information to plan appropriate physical activity programs to promote fitness in the healthy fitness zone. The level of fitness (within the healthy fitness zone) needed by any individual depends on individual needs. So, you mean to tell me that physical activity, and what a person needs to do to be considered “physically healthy” is different for everyone?! So THAT’S why, instead of “testing” and “passing” or “failing” students, we’ll just tell them how they’re doing, and what they need to do to meet the standards in the future. Makes sense. Further, fitness in youth is related as much to heredity, physiological maturity and age as it is to physical activity. At least PE teachers understand how kids learn and develop. My face…all the time when dealing with educational idiocy. This entry was posted in Education Reform, Intelligence, Rants, Sarcasm and tagged education, education reform, English, fitnessgram, irony. Bookmark the permalink. 2 Responses to Seriously, no one saw how ironic this was? LOLOLOLOLOL I’m sorry I shouldn’t laugh, but sometimes the school system makes me want to beat my head into a wall. I’m certain it’s worse for you, since you work in it. Yeah, it’s true. But I do have to laugh at it. If I don’t, I’ll probably go crazy.